I have six advance copies of the just-published Quarry’s Climax for the first six readers who request one and promise an Amazon review (Barnes & Noble also encouraged, and blog posts, too). Reviews need not be lengthy. 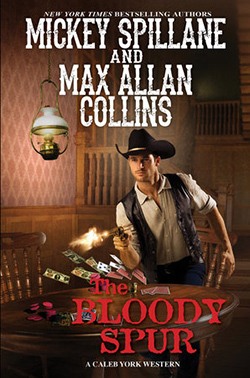 And I have six advance copies of The Bloody Spur, the new Caleb York western, which will be published in January. Rules: only the USA, foreign shipping a little too pricey. And you must include your snail-mail address in the e-mail you send requesting the book. I know many of you were disappointed to learn that Stacy Keach had stepped down from reading the Mike Hammer audios. But I was able to enlist the man who has brought Nate Heller to life many times – Dan John Miller. The Will to Kill is available now from Audible on Journalstone (the CD version isn’t available yet). Barb and I are listening to it in the car as we gallivant about the Midwest, and Dan has done a terrific job. More Mike Hammer news, which I should soon be confirming. But reliable sources tell me a Blu-Ray of I, the Jury in 3-D is at long last in the works! I love the movie and getting it on Blu-ray in 3-D is probably my remaining Holy Grail of movie collecting. I have seen it theatrically in 3-D, which improves the movie immeasurably. The cinematography is by the great noir master, John Alton, and it’s written and directed by Harry Essex of Creature from the Black Lagoon fame. The cast includes the much underrated Biff Elliott as a very Mickey-like Hammer, the lovely Peggie Castle, Preston Foster, Elisha Cook Jr., and John Qualen. I am sorry to report that we walked out of Blade Runner 2049. I have friends (including Terry Beatty) who loved it. I found it infuriatingly poor in pacing and coherence, despite the plot being simple. We gave it an hour, and when we left, Harrison Ford hadn’t been in it yet. When I got home, I did some checking and discovered the director, Denis Villeneuve, had been responsible for two films I despised, Sicario and Arrival. I should have done my homework. It has been, as people of my generation are wont to say, a bummer, having to bail out of the Toronto Bouchercon at the last minute. Matt Clemens is having such a good time there that I have determined to throttle him when he returns (in his sleep – he’s bigger than I am). But it was necessary (staying home, not throttling Matt). I had another rough week, and am goofed up on meds as the docs work on getting me regulated to where I can have the jump-start procedure that will, I hope, take me out of a-fib and back into a regular heartbeat. Good thoughts and prayers are appreciated, but what I really want you to do is buy Quarry’s Choice. Well, the TV geniuses have screwed up Wild Dog already. Read it and weep. Barb is speaking at a brunch in Muscatine on Thursday. A rare public appearance by my beautiful, somewhat publicity-averse wife. 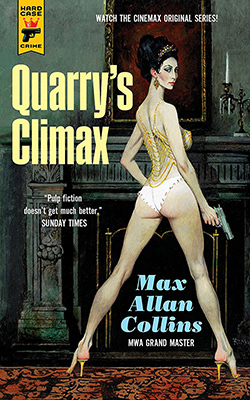 Here is a lovely article about Quarry, with a gallery of the Hard Case Crime covers. Check out this lovely Quarry’s Climax review. And here, I am pleased to say, is another. You were much missed at Bouchercon, but Matt seemed to be having enough fun for both of you. Best of luck on the meds front, Max. I didn’t make it to Bouchercon Toronto, either, but for different reasons. I hope you didn’t feel that way about Denis Villeneuves’ film “Prisoners.” I loved that movie. I agree with you on Sicario though and although I did see the ending coming a mile away for Arrival I still liked it.